So it turned out that the pattern of this game was set within the opening two minutes. 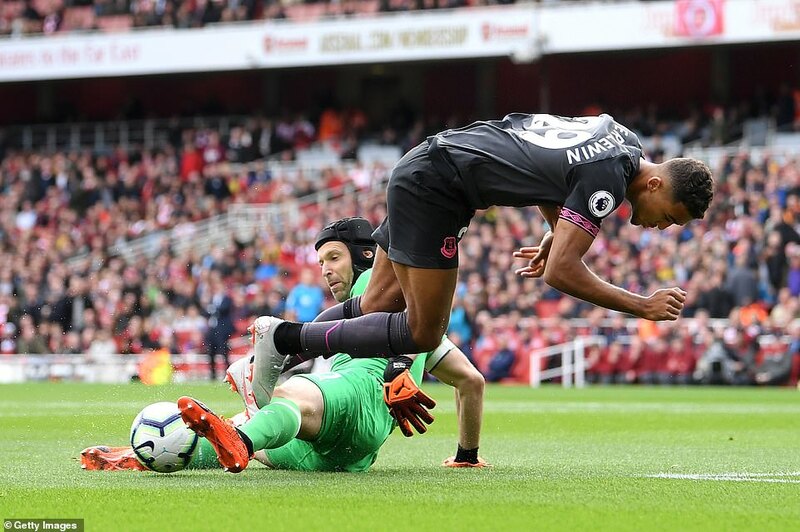 Everton striker Dominic Calvert-Lewin was played clear on goal but was denied by Arsenal goalkeeper Petr Cech when he should have scored. At the time it looked a little careless but also forgivable. It looked as though the young forward was simply caught a little cold by such an early opportunity. It happens. But sadly for Everton, it turned out that the miss was not isolated but instead the opening sequence of a depressing pattern. 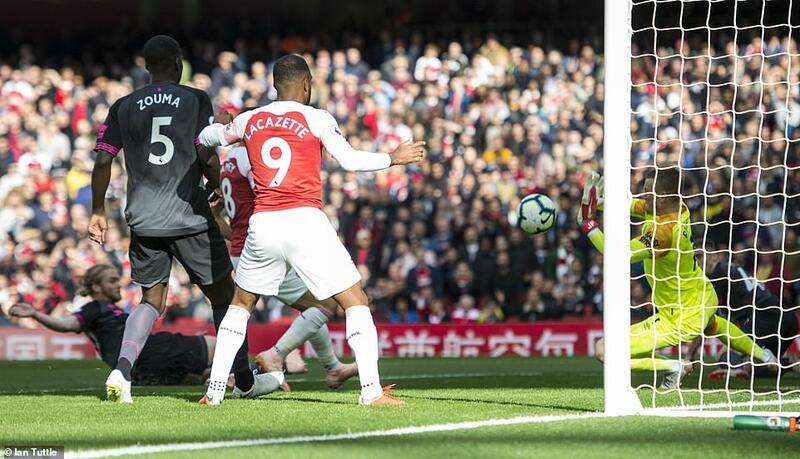 The better team for much of this game, Marco Silva’s side played with ambition and enterprise but when it came to scoring goals they were useless. 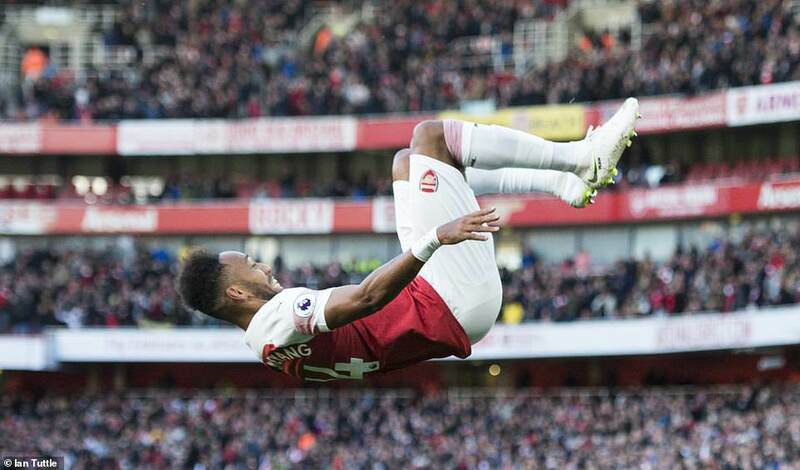 Arsenal (4-2-3-1): Cech 8.5; Bellerin 6, Mustafi 6, Soktaris 6 (Holding 38mins 6), Monreal 6; Xhaka 6.5, Torreira 6; Ozil 6, Ramsey 7 (Welbeck 79mins 6), Aubameyang 6.5 (Iwobi 67mins 6); Lacazette 7. 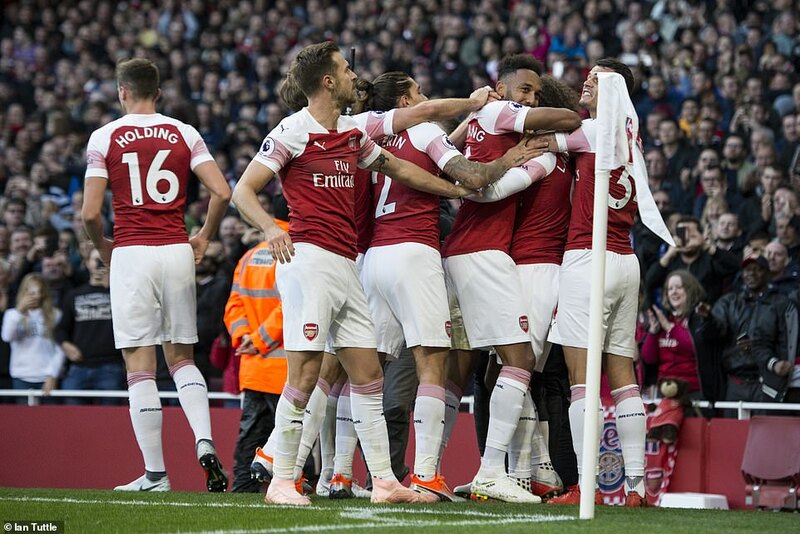 Subs not used: Elneny, Lichtsteiner, Leno, Guendouzi. Everton (4-2-3-1): Pickford 7; Kenny 6, Keane 6, Zouma 6, Digne 6; Gueye 6.5, Davies 6; Walcott 6 (Bernard 71mins 6), Sigurdsson 7.5, Richarlison 8; Calvert-Lewin 6 (Tosun 71mins 6). Subs not used: Holgate, Baines, Schneiderlin, Stekelenburg, Lookman. 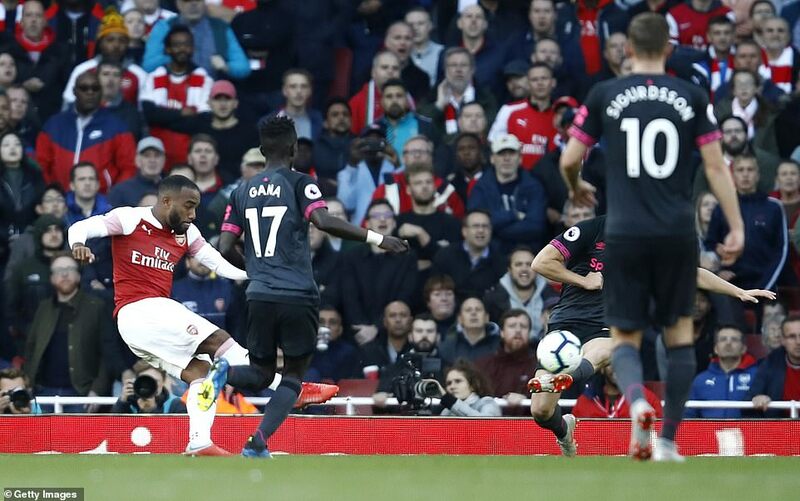 Alexandre Lacazette opened the scoring after 56 minutes with a sensational finish into the top corner. By full-time, Everton had created at least half a dozen good chances and Cech had saved each and every effort. The Arsenal goalkeeper deserves credit for that but at the same time he shouldn’t have been given a prayer with some of them. 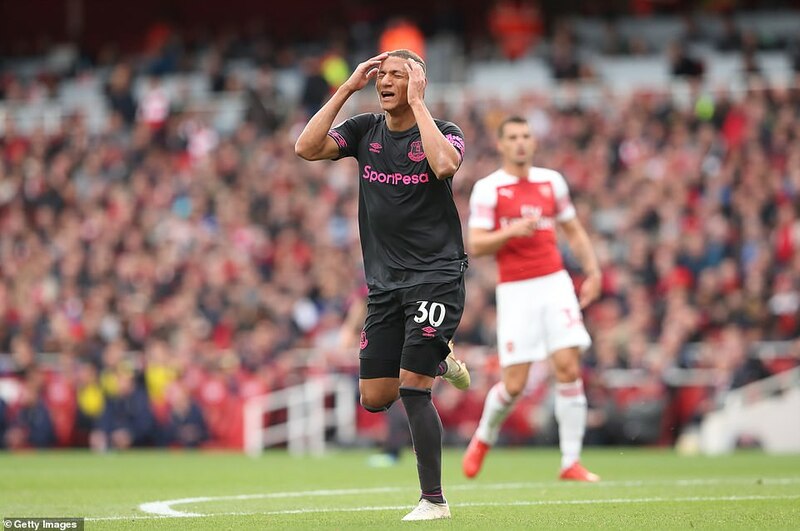 So it was always likely that Everton – for whom the Brazilian Richarlison was a constant menace – would pay a heavy price against a far from convincing Arsenal team that nevertheless remains capable of hurting teams when given the chance. 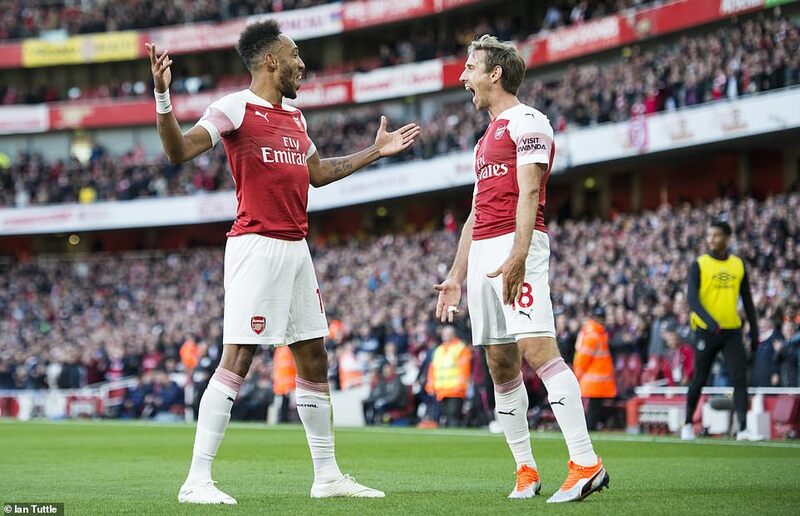 Sure enough, two goals in three second half minutes eventually earned Arsenal the win. 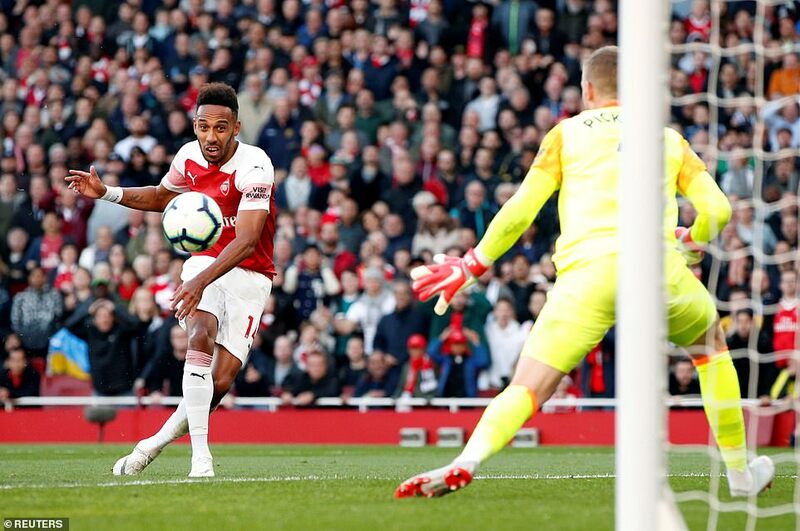 The first from Alexandre Lacazette was a beauty – curled in with his right instep – while the second from Pierre-Emerick Aubamayeng was at least a yard offside. This mean that Silva and his Everton team headed home with something to complain about. They may have been able to recover a one-goal deficit but two was always likely to be too much. 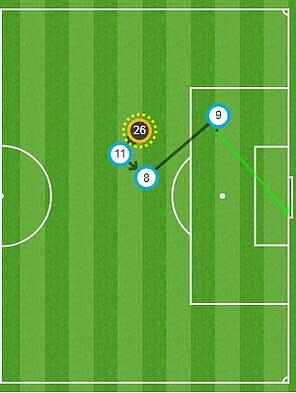 But despite the nature of the second goal, Everton only really have themselves to blame for this. They will play worse this season and win. In an open first half there should have been goals but the quality inside the respective penalty areas did not always match the build-up play of both teams. With both sides committed to attack, it was never likely to be a dull game and that was the way it turned out. 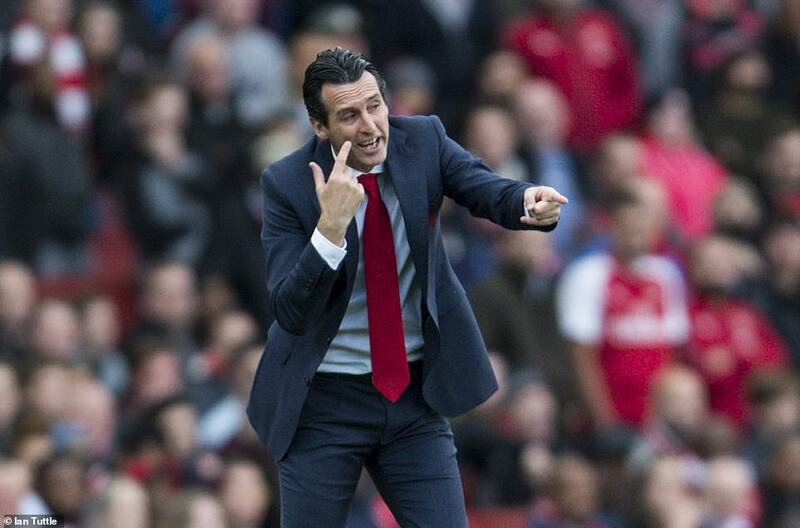 Arsenal have done well enough so far under their new coach while Everton have been a little slower to get going under theirs. But here Everton were quick out of the straps and young Calvert-Lewin should really have put them a goal up in only the second minute. Played clear down the right side, Calvert-Lewin was clean through and had he lifted his head would have seen team-mate Richarlison unmarked to his left. 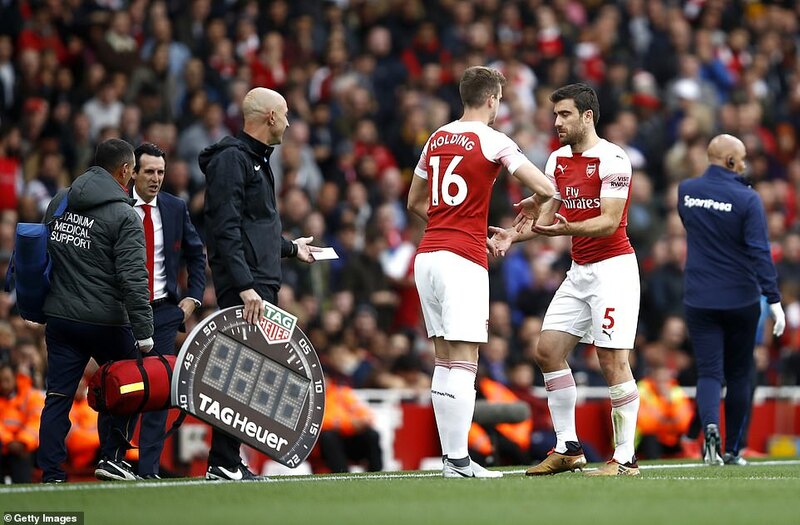 But the 21-year-old tried to dribble the ball round Cech – perhaps hoping to draw a foul – and was tackled cleanly and fairly by the Arsenal goalkeeper as the opportunity to make an explosive start went begging. 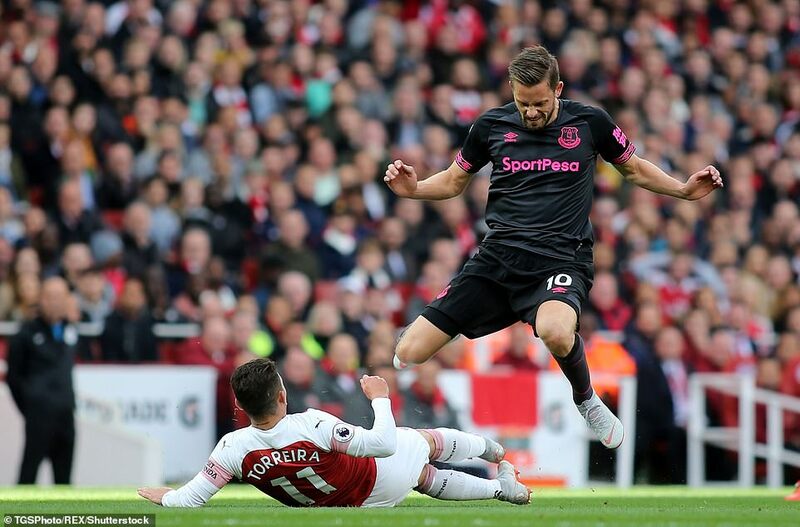 The Everton striker should have done better and he knew it but the move was typical of Everton’s incisive attacking play and other opportunities were to come their way soon enough. 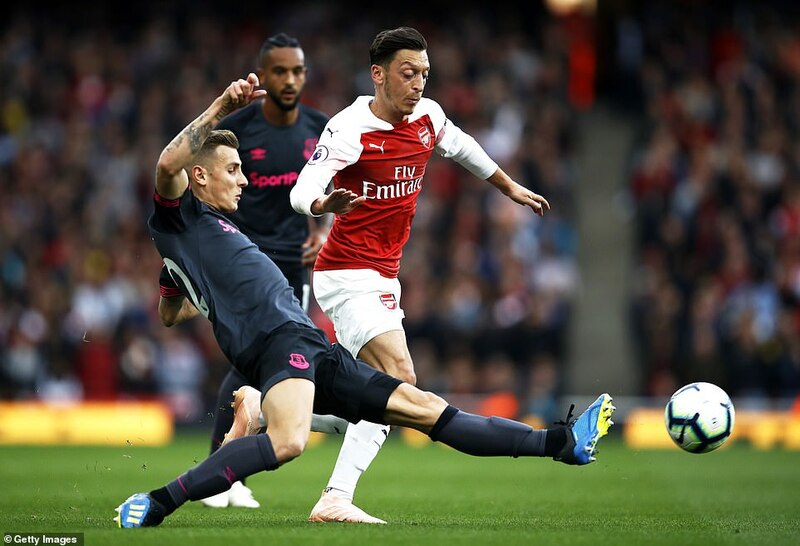 Arsenal had handed a Premier League debut to Uruguyan midfielder Lucas Torreira and the 22-year-old did his best to bring a competitive edge to the home team in the centre of the field. 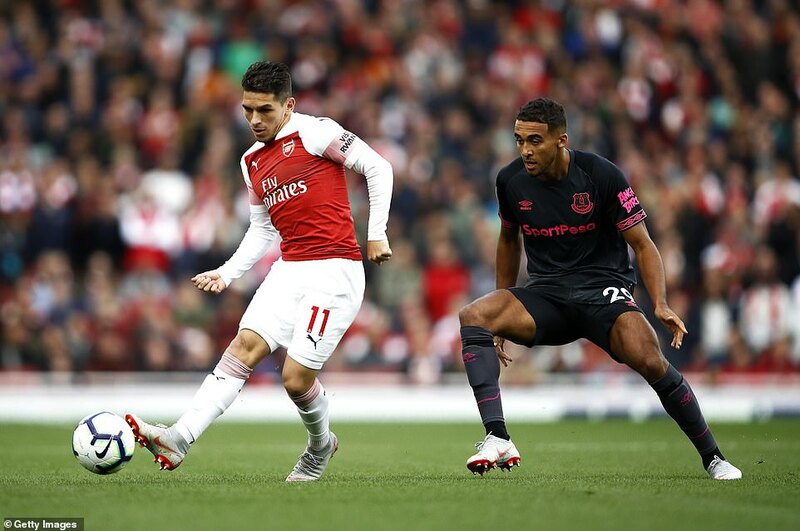 Too often, though, Everton were able to find space in between the Arsenal back four and midfield and in particular Richarlison was dangerous when he found time to examine the nerve of Arsenal right-back Hector Bellerin. Twice in the early stages the former Watford player was able to isolate Bellerin, turn him round and run past him. 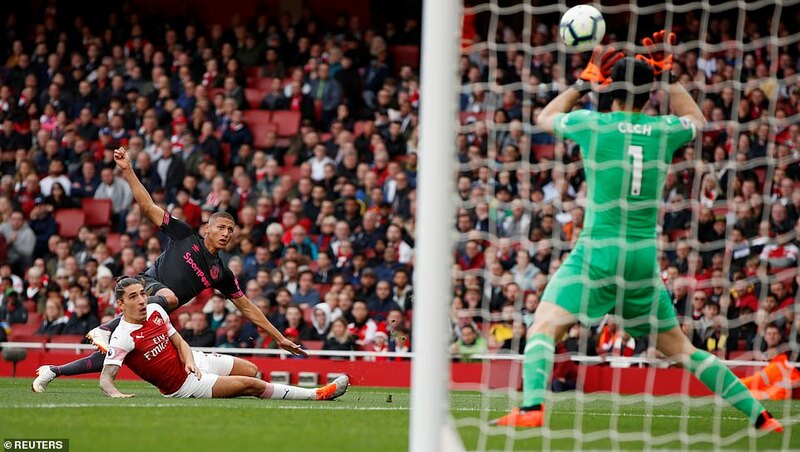 Both times Richarlison got shots away with his right foot and though one was saved by Cech and the other missed the far post it was clear that Arsenal had a problem down that side of the field. 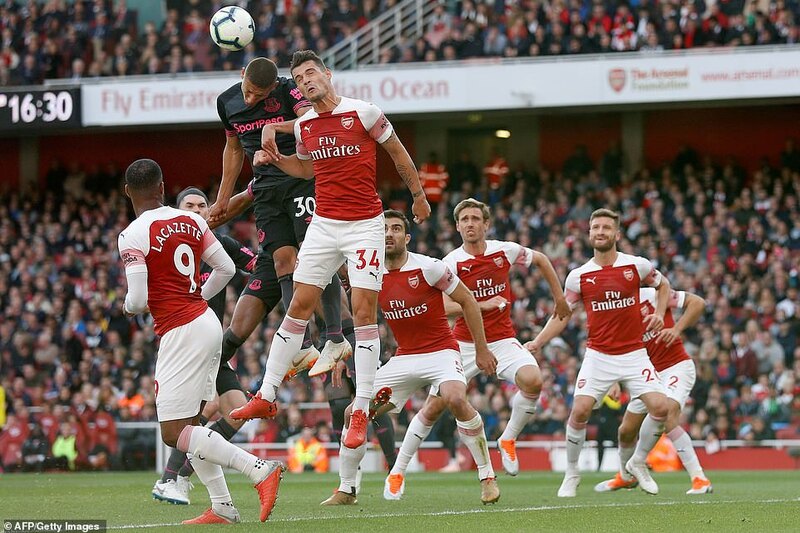 Towards the end of the opening half Richarlison was at it again – easing in to space and forcing Cech to save a rising shot – while just before that Arsenal old boy Theo Walcott was played in to space down the other flank and was denied by Cech’s right foot. 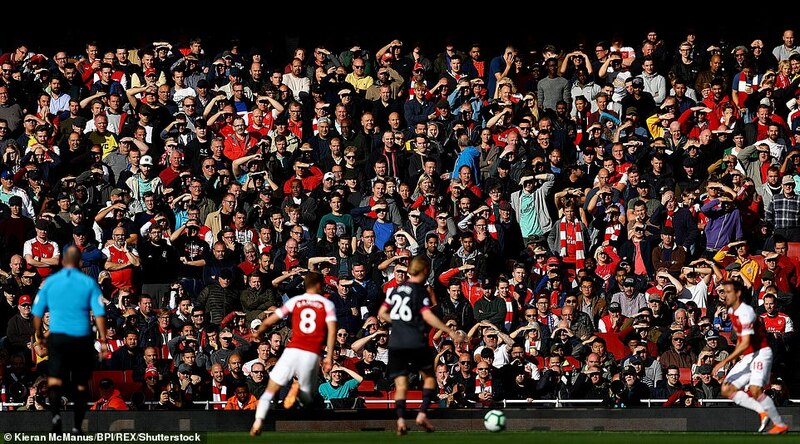 In between all this there was plenty of Arsenal possession and some chances of their own. 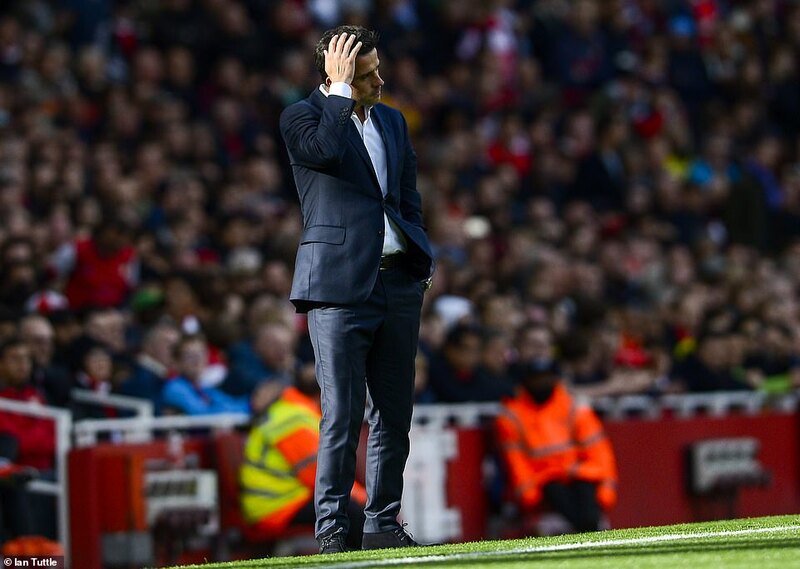 But coach Unai Emery could not have been happy with the amount of space Everton were finding in the Arsenal half. 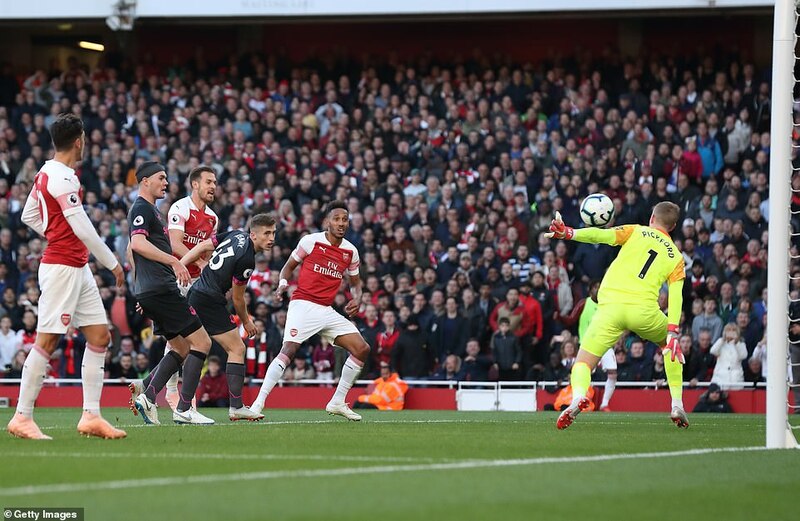 If Cech had a good half then so, in fairness, did Everton goalkeeper Jordan Pickford. 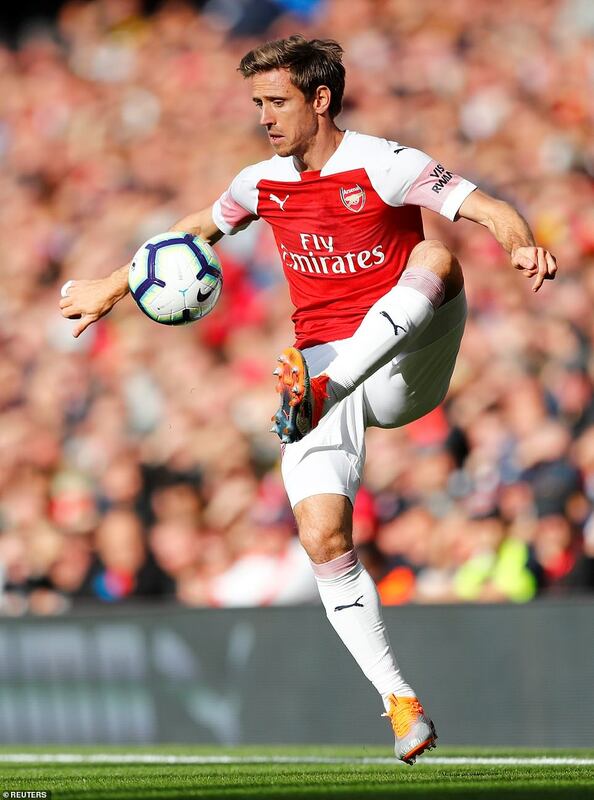 The England keeper denied Nacho Monreal in the 12th minute when a Bellerin cross to the far post was played back inside to the full-back by Aubamayang and on other occasions he was helped by his defenders, Michael Keane intercepting a low cross from Mesut Ozil before Lacazette dallied at the far post to see a chance pass him by after Aaron Ramsey had offered him a route to goal. In to the second half and for a while it looked as though Everton were still the more likely scorers. 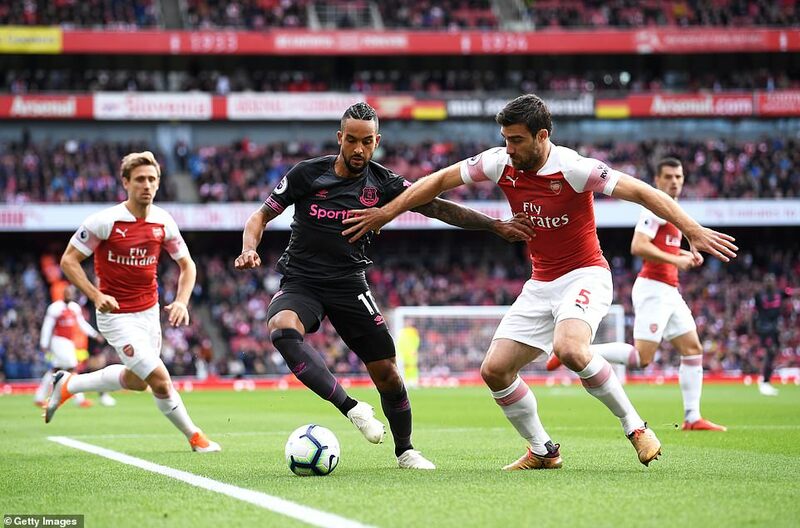 Silva’s team seemed to have a momentum that was alien to their opponents and came close again as Walcott headed straight at Cech after Lucas Digne crossed from the left. 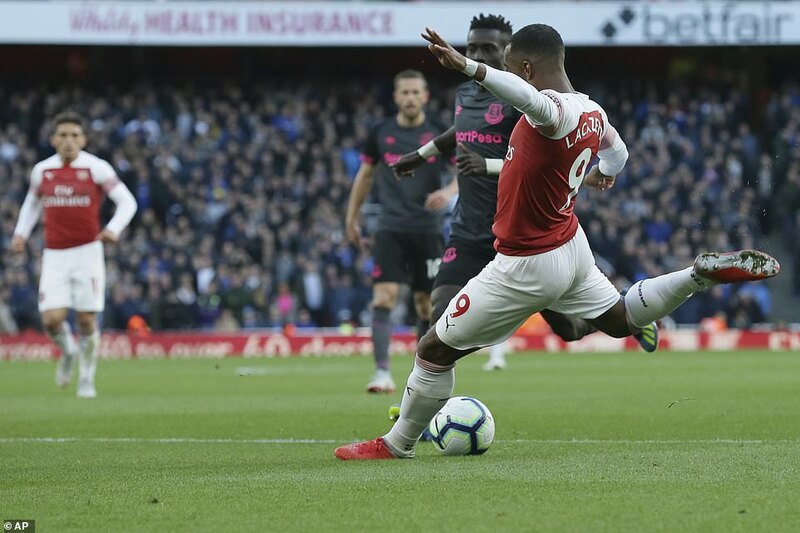 But Everton’s failure to take chances soon haunted them as Arsenal took the game away from them with two goals in three minutes just before the hour. 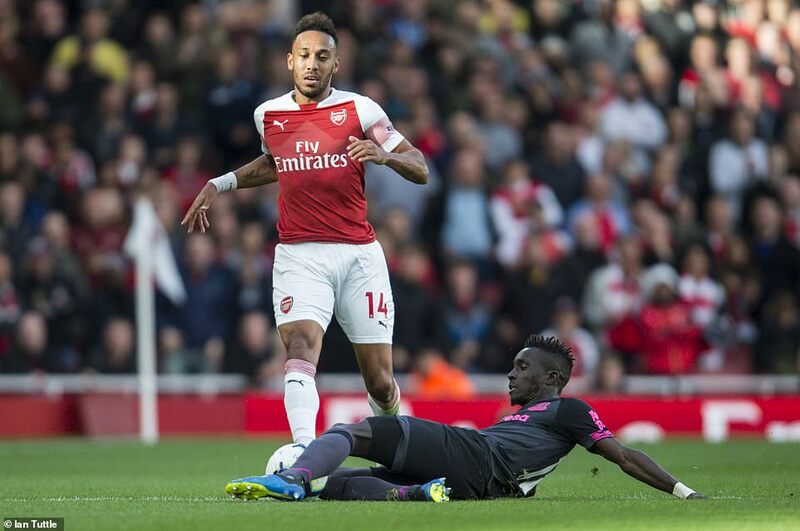 The first one came moments after Arsenal should have been given a penalty, Aubameyang heading the ball on to Jonjo Kenny’s arm. 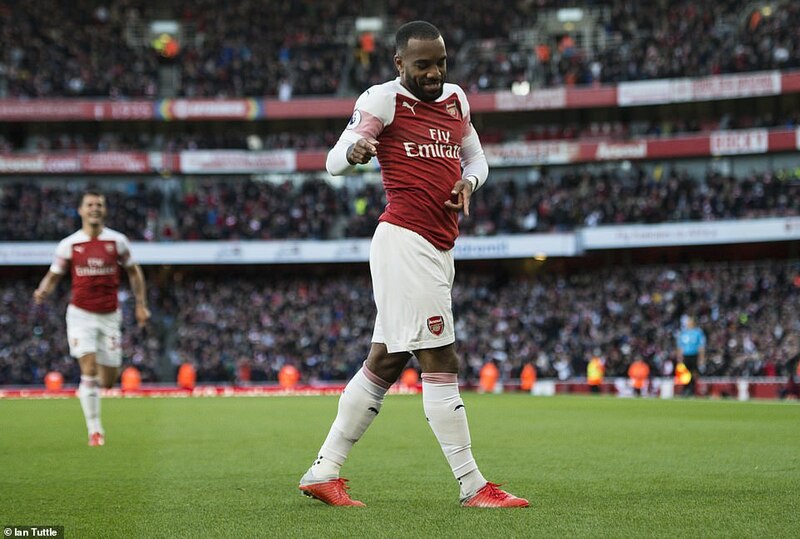 Maybe fuelled by this injustice, they upped their intensity a little and when Ramsey beat Davies to a loose ball and fed Lacazette in the 56th minute the Frenchman curled a lovely right foot shot past Pickford from sixteen yards. 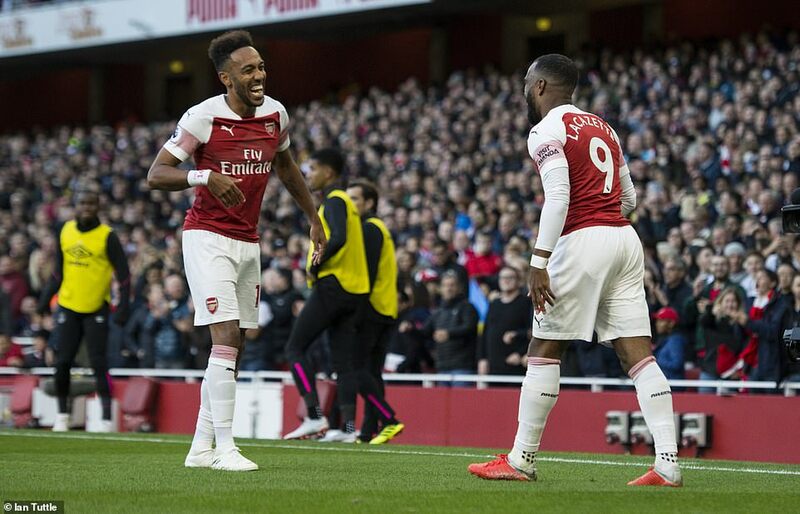 It was a finish quite out of keeping with anything the Arsenal forward had contributed previously but it gave his team a lead that seemed to bolster them and at the same time discourage their opponents. The second goal arrived in the 59th minute and was again the product of a moment of indecision. 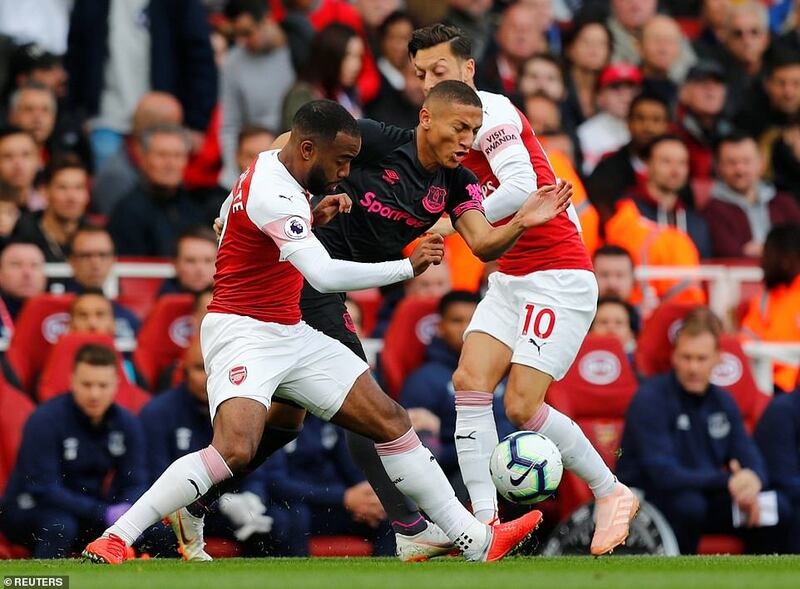 This time Everton failed to challenge properly for possession over on the right side and although Ozil and Ramsey made rather a mess of things when trying to convert a two-on-one opportunity into a goal, the ball ran free for Aubameyang to rifle the ball in to the net from close range. It was a bad goal for Everton to concede but also, as it turned out, an illegal one. 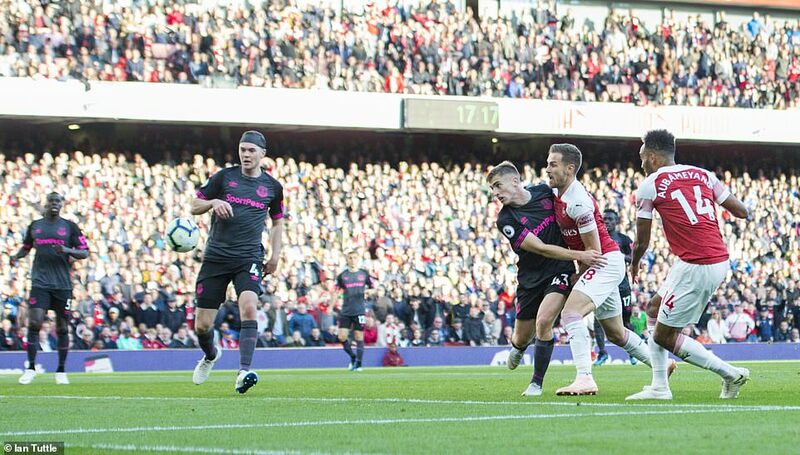 Replays showed that the goal scorer was a good yard offside when Ramsey unintentionally played the ball to him but this was somehow not spotted by the linesman, who was standing right in line on the far side. 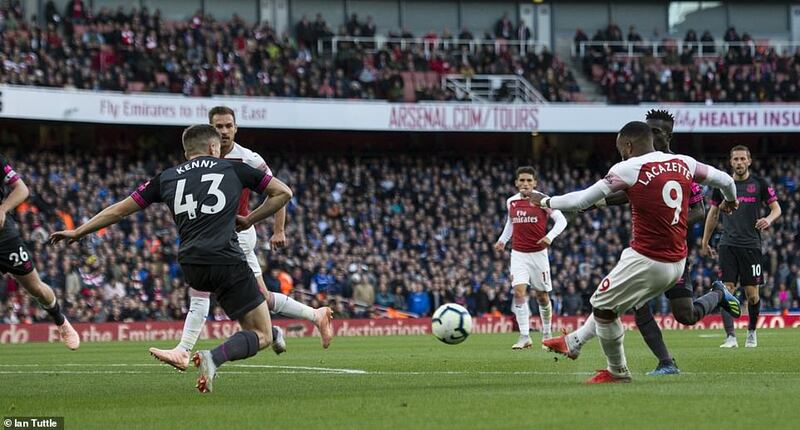 So all of a sudden Arsenal had not only a lead but also breathing space and this was not something that had looked at all likely until Lacazette opened his body to score the first goal. 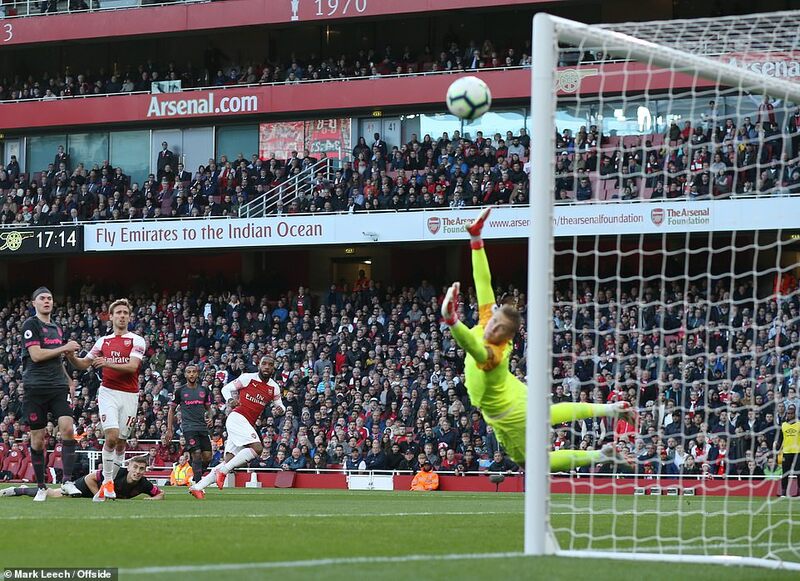 Everton, to their credit, came again and Cech made his fifth big save of the game with 20 minutes left, diving low to his left to turn away a header from Richarlison who made moved on to a free-kick totally unmarked. That rather summed up the game, at least from an Everton point of view. 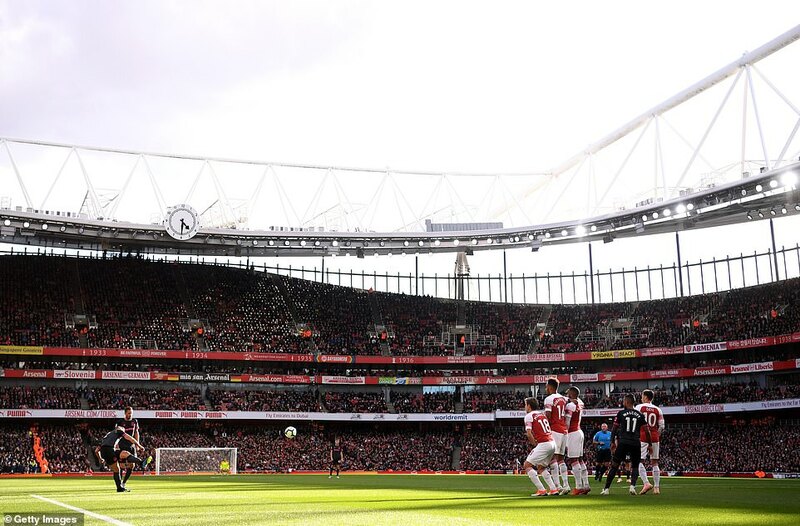 An away team is only ever going to create a handful of chances at a place like the Emirates – no matter how accomplished the performance – and when they come it remains a good idea to try and convert a couple. Silva made changes to try and salvage something but the Richarlison header represented Everton’s opportunity to turn the game back their way and after that there was little else to them to cling to. 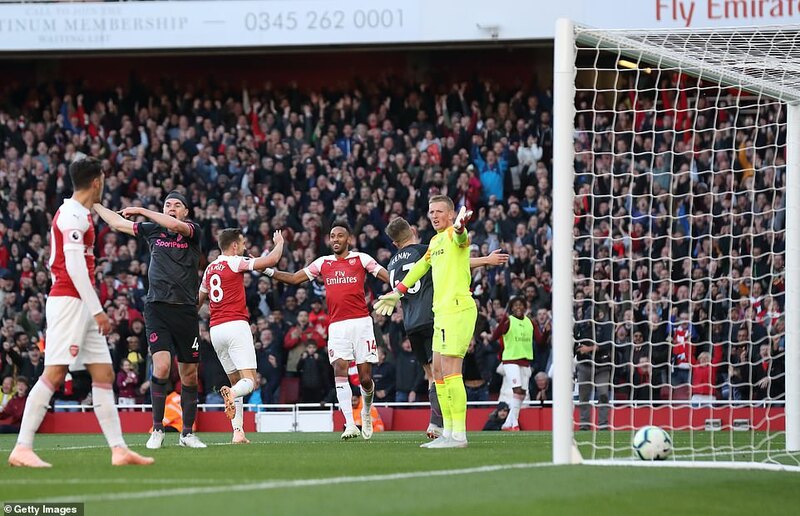 On this evidence there is little between these teams but ultimately there were two goals to separate them here and in the Premier League table the gap sits at six points.